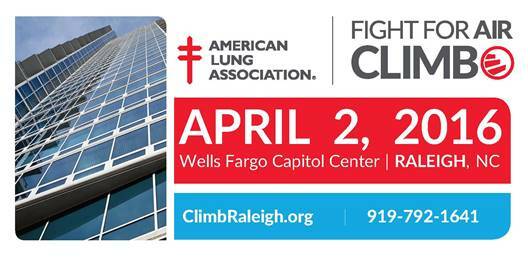 The Raleigh-Durham chapter of the American Lung Association is hosting a unique fundraising event on Saturday, April 2, 2016. Instead of the typical 5k run format, the ALA is taking their efforts to the 30 floors of stairs of the Wells Fargo Capitol Center in Downtown Raleigh – that’s 618 steps, in case you’re wondering. Participants raise funds to support the mission of the American Lung Association while training to climb the stairs of a skyscraper, stadium, or other landmark building. Don’t Miss: The Climb has become a signature event for firefighters, police officers, and EMT. Some of them even participate in FULL gear! 100-200 participants are expected for the climb and volunteers are needed to help with all aspects of the event from setting up, helping to run the actual event, packet pickup, and more. Volunteers will be provided water and breakfast the morning of the event. Call 919-624-4979 to sign up to help. The local ALA chapter hopes to raise $60,000 with this weekend’s event. You can register or get more information at http://www.ClimbRaleigh.org.